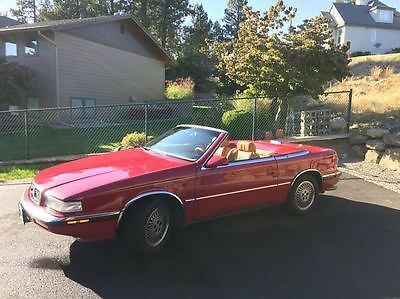 1990 CHRYSLER T/C BY MASERATI ... 68,790 Original Miles HARD TOP, SOFT TOP 1990 CHRYSLER T/C BY MASERATI ... 68,790 Original Miles HARD TOP, SOFT TOP Engine : 6 Cyl, 3.0L Transmission : Auto Exterior : White Interior : Tan Body Style : Convertible Vin : ZC2FS1208LB205706 This One owner beauty comes to us from Texas, it has Hard top, Convertible Soft top, Automatic Transmission, Air bag, ABS Power Brakes, Leather / Power seats, Power mirrors, Power windows, Power door locks, Tape / AM / FM, Cruise control and Air Conditioning. Tires have at least 90 % thread left. The paint looks original with absolutely no rust anywhere on the car. Our mechanics performed full service on this car, they have also replaced the tie rods as well as ball joints. It will be sold with a clear title and it will be sold as-is, where-is. For a complete CARFAX REPORT click the link bellow ---Carfax--- http://www.roverclassicpictures.com/listing_pictures/1990-CHRYSLER-T-C-BY-MASERATI-ZC2FS1208LB205706/carfax.pdf We have taken many pictures of this vehicle, and we know that it can be a pain to click each one of them separately, so we have created a web page that contains a slide show. You are welcome to click the link bellow to be taken to the slide show page or You are welcome to scroll down this page to view each picture separately ---Slideshow--- http://www.roverclassicpictures.com/listing_pictures/1990-CHRYSLER-T-C-BY-MASERATI-ZC2FS1208LB205706/slideshow.html !!! This Car Qualifies for up to 550$ cash back !!! (Call us before You Bid, and We will tell you how you can get up to 550$ off from the price of the car) We offer our customers LOW COST DELIVERY Please see the map for the approximate delivery charge, Please contact us for the exact delivery charge. Delivery is not done by us, it is done by Fully insured Trucking companies that we subcontract to deliver our cars. Click on the map for approximate delivery rate Please be aware that we charge $149.00 Documentation Fee. This fee will be added to final cost to cover our expense for paperwork and mailing. Please email us or Call us with any questions prior to bidding We are also open to BUYitNOW offers 1-321-CLASSIC (1-321-252-7742) Click on the map for approximate delivery rate SOME OF THE CARS THAT WERE SOLD BY US If you have any questions please email us or call us prior to placing Your bid 1-321-CLASSIC 1-321-252-7742 Mike TERMS OF SALE 1. Placing a Bid: By bidding on this vehicle you are entering into a legally binding contract to purchase this vehicle and you agree to abide by all terms of sale set forth herein. 2. Vehicle Representation: Although we describe all our vehicles to the best of our abilities, it is still possible that we may have unintentionally made an error or left some information out. Please keep in mind that used vehicles may have typical dings and scratches inherent for their year and mileage. Interior wear should also be considered depending on the vehicle’s year and mileage. Opinions and expectations can vary, so please contact us if you have any questions or concerns regarding the condition of this vehicle. Used cars may not come with all of the original books, keys or accessories. Please review all photos carefully and if there is anything you are not sure about, ask questions prior to bidding. We are not responsible for errors or omissions in our listings. The mileage may be different than advertised due to test drives and demos. 3. Vehicle Inspection: We welcome and encourage potential buyers to inspect the vehicle but such inspections MUST be conducted prior to completion of this auction/sale. This vehicle is available for inspection at any reasonable time. If you choose to have the inspection done by a licensed professional, you must do so at your own expense. It is the responsibility of the buyer to have thoroughly inspected the vehicle, and to have satisfied himself or herself as to the condition and value based solely upon that judgment. Furthermore, it will be assumed that you have inspected this vehicle fully if you have placed the bid or sent in your deposit. 4. Financing: If you are planning to finance this vehicle through a lending institution, you must secure the loan prior to bidding. Secure all finances and be able to follow through with the payment before you bid. Please do not call us for financing help, we do not provide financing. 5. Warranty: Unless stated otherwise, this vehicle is being sold “as is” and "where is" with all faults and possible defects. No representations or warranties are made by seller, either express or implied, including but not limited to warranties of title or implied warranties of merchant ability or fitness for a particular purpose. Nor are any representations or warranties relied upon by bidders in making bids. We are not the first owners of this vehicle and therefore cannot guarantee history, condition, reliability, mileage, title, salvage/history of salvage, function or performance of the vehicle. You are only buying what we have. Manufacturer’s warranties may still apply. You may chose to purchase extended warranty from many aftermarket warranty companies that can be found online. 6. Vehicle Transportation: Buyer is responsible for shipping and/or pickup of the vehicle. All shipping charges are the buyer’s responsibility. We will not be responsible in any way for claims arising from shipping damage. Shipping companies have insurance policies that protect buyers against damage. If you choose to pickup the vehicle yourself, you would have to take care of your own temporary plates. We do not provide any, nor do we help you in obtaining them. We do not meet you at our local airport, closest airport to us is Newark, NJ. 7. Payment Information: If you are the winning bidder/buyer, you must contact us within 24 hours of winning the auction or getting invoice to set up payment arrangements. We do add 149 dollar fee to every car we sell. We require a 500 dollars non-refundable deposit within twenty-four (24) hours. This deposit can be made through PayPal to fellyNY at gmail.com (Paypal deposit is used to place a hold on the car, it will be refunded back to PayPal, ones the car is Paid in full. Usually this is done with in 1-2 days after the car is paid in full). In the alternative, you can make your deposit Cash in person or Bank wire transfer. If the deposit is not received within the required time frame and alternative arrangements were not made, we reserve the right to make the vehicle available for sale to another buyer. The remaining balance is due within 5 calendar days of making the deposit. You must fax or email us your State issued driver’s license after you make the deposit. We reserve the right to keep your deposit and resell the vehicle to another buyer if final payment is not received within 5 calendar days. As final payment for the vehicle, we will accept a certified bank check, bank loan check, wire transfer, or cash. We will not release the vehicle and/or title until funds clear. If you pay cash, you can pickup the vehicle immediately. If you pay by wire transfer the vehicle will be available for pickup once funds are available in our account. If you pay by bank check, you will have to wait nine (9) business days until the funds clear. 8. Title Information: Vehicle titles may be held by banks or lenders as collateral for loans. In some cases there is a delay in receiving the original paper Title after the vehicle is paid off. While we usually have all titles in our possession at the time of sale, there are occasions where we may have to wait for them to arrive. It may take anywhere from 3 to 7 business days for us to receive the title. 9. Bidder’s Age: You must be 18 years of age or older to bid/purchase. 11. Storage Terms: Once the auction/sale completed, we will store the vehicle free of charge for six (6) calendar days and at 20 dollars per day after that. Ones the payment has been made, the vehicle will be stored free of charge for ten (10) calendar days and at 20 dollars per day after that. 10. Liquidated Damages: In the event that the winning bidder refuses to honor his/her obligation to purchase the vehicle, we shall be entitled to liquidated damages from that bidder as follows: a. $5,000 in liquidated damages on a vehicle sold for $15,000 or less. b. $7,000 in liquidated damages on a vehicle sold for $15,001 - $40,000. c. $10,000 in liquidated damages on a vehicle sold for $40,001 or greater. 11. Choice of Law & Forum: Buyer agrees that in the event any dispute shall arise, it will be governed by and construed in accordance with the laws of the State of New York and litigated in Richmond County. By bidding on this auction/sale buyer consents to service by certified mail. 12. Miscellaneous: We reserve the right to obtain and verify the registered information of all users who bid on this auction/sale. In order to protect the integrity of this auction/deal, buyers with zero or negative feedback must contact us prior to bidding. We reserve the right to cancel any and all bids at our discretion and end the auction early in the event the vehicle is sold locally prior to the end of the auction, we shall not be held liable for such cancellations. 13. Not responsible for Typographical errors, if you are not sure about something just ask us. 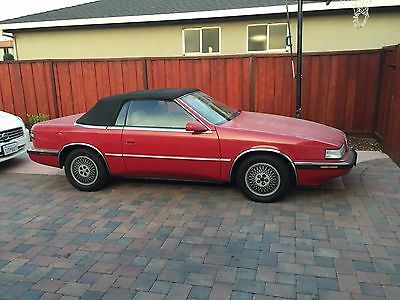 1989 Chrysler TC Convertible by Maserati The TC was jointly developed by Chrysler and Maserati as a grand tourer and was introduced at the 1986 at the Los Angeles Auto Show. After 2 years of development delays, the TC became available in late 1989 and only 3,764 units were manufactured in Milan, Italy. It is powered by a 2.2L turbo charged engine and is equipped with a 3 speed automatic transmission. This TC features a detachable hard top with opera windows and a manually operated black convertible, Ginger leather interior and Red paint. The TC's dash, door panels, seats, armrest and rear fascia panels are covered in hand-stitched Italian leather. Inside doorjambs were finished with stainless steel panels and sill plates. The convertible boot, over which the hardtop rests, is a body colored metal panel. A special interior storage compartment came with an umbrella, tool kit and small spare tire that allowed the use of the full-sized trunk even with the top down. Standard equipment included a 10-speaker Infinity AM/FM cassette stereo, power windows, 6-way power seats, power door locks, map lights, puddle lamps, cruise control and tilt steering. 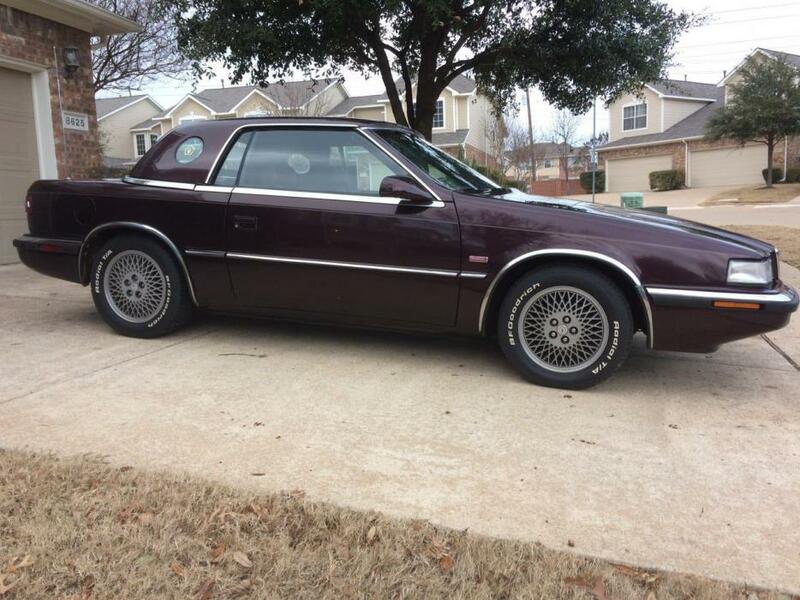 This particular example is completely original with the exception of the CD player and the new alloy rims and tires. It is in very good condition except for a little damage from a parking lot incident on the front left corner. It currently has 75,021 miles and everything is working as it should. Considering its limited production and the overall condition of this beauty it sure to sell quickly so you better call before it’s too late! Price Reduced to $4,900 Very Reasonable Offers Still Considered! **************************************************************************************************************************************************** Better pictures and a video of the engine running are available on our website. Please e-mail John@HotRodsChoppers.com for a direct link. **************************************************************************************************************************************************** We try to respond to all questions right away but please keep in mind that our office hours are Tues - Fri from 9:00 - 6:00 pm and 9:00 - 3:00 on Saturdays CST. You are also welcome to call us during those hours at (815) 625-2500. **************************************************************************************************************************************************** We require a $145.00 documentation fee in addition to the sales price for all customers. IL residents will also have to pay 7.75% sales tax, title and registration fees. 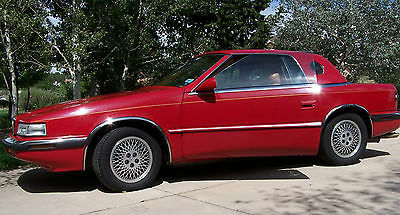 Chrysler TC by Maserati 1989 16 valve Exterior Color: Royal Cabernet Pearl Coat (available in 1989 only) Interior Color: Bordeux California Emissions Just 68 cars came with this color combination and the Maserati engine for the full production run (15 with california emissions pckg). Out of the 7300 TC´s ever produced, only 501 came with the DOHC 16 valve Maserati Engine and the 5 speed Getrag transmission, of those, 387 were 1989 models. Built in milan Italy, this was a Joint-Venture between Chrysler and Maserati intended to compete with the Cadillac Allante. The car is in very good and original condition, most of its paint is original, it was always properly stored during winter, it has new tires and has no modification at all, It is a great car that needs little detaling in order to get it back to showroom condition. Engine Smokes a little bit, could be a valve seal. (car runs strong and smooth). Rear bumper trim needs to be replaced. Power antenna needs to be fixed (not changed). Original Speakers needs to be fixed (not changed) Original seats needs to be restored (resewed), leather is not ripped or broken Original center armrest needs to be re-upholstered Very few dings and scratches Great opportunity, I have to sell it because I dont have room to store it. It is now sitting on the drive way and I dont want it to keep it on the outside. Buyer is responsible of picking up the car, since it is not registered. 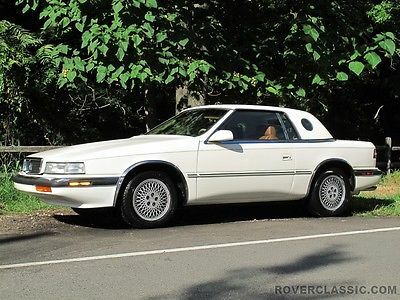 This unique and collectible 1989 Chrysler / Maserati TC convertible is in showroom condition. It has been garaged and is in excellent condition inside and out. See pictures. Only 3,764 were made in 1989. 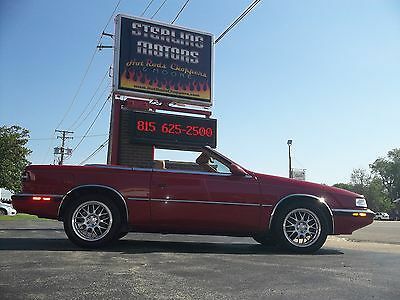 Asking $8499.99Red ExteriorLeather Beige InteriorEngine is a Daytona-spec turbocharged 2.2 L straight-42-door convertible (hard top)FWD (front-wheel drive), automatic 3-speed gearboxOnly 24,620 original miles! 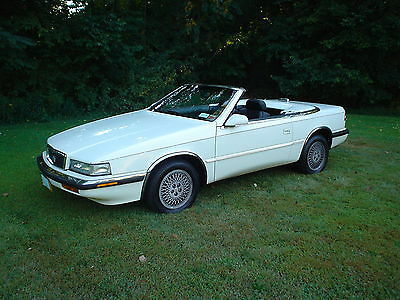 Selling my 1991 Chrysler's TC (Touring Convertible) by Maserati. I am the second owner of this car. It is equipped with a three liter V6 engine with an automatic transmission. It has the usual power options including power windows, mirrors, seats and door locks, all of which work fine. Also has alloy wheels, Italian full leather interior. The car is in great shape inside and out with the exception of the dashboard leather on the passenger side which has shrunk and the seat bolster on the driver's side has some wear. It runs and drives excellent. It has four brand new tires, radiator and battery. Has just had an oil change and New York State inspection. Garage kept and not used during the winter months. Looks to be original paint. Includes matching fiberglass hard top with storage cart and cover, owner's manual and all original keys. 73,000 original miles. Viewings by appointment are welcomed. Serious inquiries only. You will not find another car like this. This car is a 1989 Chrysler tc by Maserati with barely 62k miles on it. This car has had only two owners including myself. The car was specially made for the first owner in Italy by Maserati. This car has always been garaged and taken care of with regular tuneups. The car has never been smoked in. There are no mechanical problems now and don't appear to be any in the near future, i have it regularly checked by a mechanic. The only cosmetic issue is a small crack in the windshield. The first owner was an elderly man who only drove it in the summer and even then it was never his primary vehicle. It spent most of its time in his garage which is why it has such low miles. I had it looked at by a mechanic before buying it and it was and still is in excellent condition . It's turbo engine runs terrific. It takes Regular gas but i always use premium. It comes with both the soft top which folds into the car itself and the hard top which is removable from the car. It gets 25-30 combined mpg. There is a spare tire in the back seat as well (see pictures). This car has never been in an accident or even a minor scrap up with a curb and the exterior shows that it has been taken care of as such. This car has been babied its whole life and will make someone very happy. Feel free to text, call or email. I can answer any questions you may have. 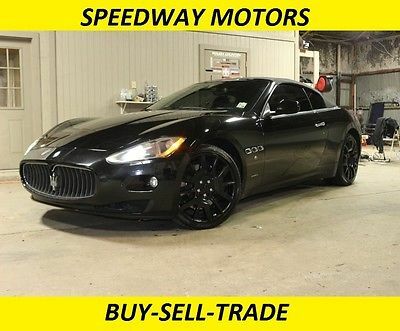 Photo Viewer 2007 Maserati Quattroporte Vital Information Year Make Model Mileage Engine 2007 Maserati Quattroporte 41,277 4.2L DOHC MPFI V8 Exterior Interior Stock# VIN Alfieri Grey Metallic Black #70030757 ZAMFE39A970030757 Photos Contact Us Dealer Contact Dallas Autos Direct Ask Dealer A Question If you have a question, please call or complete the form below for a quick response. Name Email Phone Question(s) Standard Equipment EPA FUEL ECONOMY RATING City 13/hwy 19 (4.2L engine/6-speed auto trans) EXTERIOR Auto-dimming heated folding pwr mirrors Front fog lights Automatic rain-sensing speed-sensitive variable intermittent wipers Pwr sunroof Front mud flaps Rear lip spoiler Projector beam lens bi-xenon headlights Body-colored front/rear bumpers Chrome door handles INTERIOR Illuminated glove box Ashtray Carpeted floor covering Simulated suede/leather rear seats w/pwr fore/aft/reclining adjustment, manually adjustable head restraints Front/rear reading lights Front & rear center armrests w/storage Security system w/ignition disable, panic alarm Remote keyless entry Auto-dimming day/night mirror Full floor console w/covered storage, refrigerated box Air compressor Bose AM/FM stereo w/CD changer-inc: seek-scan, radio data system, weather band automatic equalizer, digital signal processor, (9) speakers Pwr rear sunblind Seatback storage pockets Wood/leather instrument panel & door inserts Front/rear cupholders Pwr locks w/auto-locking feature Front underseat storage tray Dome light w/fade (2) 12-volt pwr outlets Rear window defroster Rear side window sunblinds Analog instrumentation-inc: tachometer, trip computer, water temp, outside temp, clock Leather 10-way pwr heated driver/front passenger bucket seats w/pwr-adjustable head restraints Covered dashboard storage Chrome shift knob Leather-wrapped pwr tilt/telescoping steering wheel w/auto tilt-away, audio/speed controls Automatic dual-zone front climate control Navigation system Pwr windows w/one-touch down Carpeted cargo area Cruise control Full cloth headliner Rear parking sensors Remote pwr fuel/trunk release Chrome interior accents Driver/passenger door bins Illuminated driver/front passenger visor vanity mirrors MECHANICAL 18" aluminum wheels 4-wheel ventilated disc brakes Chrome-tipped exhaust 4-wheel anti lock brakes (ABS) P285/40ZR18 BSW rear tires 4.2L DOHC MPFI V8 w/variable valve timing Speed-sensitive pwr rack & pinion steering P245/45ZR18 BSW front tires Rear wheel drive 6-speed automatic transmission-inc: mode select, manual mode, shift lever on column automatic with manual mode Limited slip rear differential Independent double-wishbone suspension-inc: stabilizer bars, coil springs Auto-leveling adaptive suspension SAFETY Stability control Driver/front passenger front airbags w/intelligent front passenger sensor 4-wheel anti-lock brakes (ABS) Side-impact bars Height-adjustable front seatbelts 3-point seatbelts in all positions Side-impact overhead curtain airbags Front/rear seatbelt pretensioners Electronic traction control Secure Online Credit Application Applying for a vehicle loan online is one of the quickest and easiest application methods. Our secure online application form is easy to complete, all you need are a few personal and employment details. Get started now. Below are a few of the other vehicles currently available from Dallas Autos Direct Shipping Dallas Autos Direct proudly recommends MoveCars.com for your vehicle transportation needs. MoveCars.com contains a directory of transportation providers servicing the US, Canada and beyond. Get your Free Quotes Now at MoveCars.com! View more info » About Dallas Autos Direct **Family Owned and operated Wholesale/Luxury Vehicle Warehouse. **Owned by 2 brothers born and raised in Dallas, TX. **Luxury Cars Direct pricing meaning the prices are wholesale to the public. **This is our "Open to the public" location. We have been in the Automotive industry since 2001 with the same creed: "Our customers are our family" **INDOOR HEATED SHOWROOM** **Hassle free pricing 100% best price guaranteed ** Dedicated to beating any of the competitors pricing **4 YEAR UNLIMITED MILE WARRANTIES ON MOST OF OUR VEHICLES ------FINANCING OPTIONS AVAILABLE WITH APPLICABLE FEES------- DALLAS AUTOS DIRECT ranked #1 Luxury Pre-Owned Volume Dealership in DFW. A Top Warranty Conversion by C.A.R.S. Protection Plus, awarded only to the top 100 dealers in the nation. Dallas Autos Direct offers a wide selection of vehicles in hopes to make the car buying experience as quick and hassle free as possible. Financing options available on all our vehicles. We can provide assistance to help you find financing options that fit your needs. We offer an array of services including: Pre-owned Vehicle Sales Car loans and financing Warranty Protection Plans Free Automotive Consultation Repair Facility and Part finder Reference I live out of state, but want to fly in and drive my new car back home. Perfect! WELCOME TO CARROLLTON, TEXAS! (Basically Addison, TX) We are the restaurant capital of the world. We are located conveniently on the edge of Addison and Carrollton. Addison is a well kept secret nestled in the heart of the metroplex. Home of "Taste of Addison," "Oktoberfest," "Vitruvian Lights" "Kaboom Town" and much more. Downtown Dallas is only minutes away and many upscale shopping/dining/lodging options available within minutes of our Dealership. Please make arrangements to fly into DFW or Lovefield Airport. If you let us know in advance, we can arrange to have the paperwork completed, and arrange to have you picked up at the airport. To make arrangements to pick up vehicle please contact associate for details. Please ask associate for discounts regarding hotel accommodations. Corporate rates will be applied to all guests that will be staying in the Carrollton/Addison area. Hotel conveniently located 2 blocks from dealership. Dallas Autos Direct will provide all shuttle arrangements back and forth upon receiving your vehicle. I want to buy a car from DALLAS AUTOS DIRECT, or I just bought a car from you guys, I NEED A CAR SHIPPED... GREAT....Here is a very reliable and fair transport company we can recommend: www.crestlineautotransport.com DALLAS AUTOS DIRECT is conveniently located between Keller Springs and Trinity Mills off Midway Rd next door to RAC Performance and across the street from Dallas Lease Returns. We are blocks away from the Addison Airport Our address is 3228 Skylane Dr. Carrollton, Texas 75006. Hours of Operation : Monday-Saturday 9 a.m.- 7 p.m. Disclaimer: Vehicle Options, Availability, and 3rd Party Advertising We do our best ensure all listings are current and accurate, but with such a diverse inventory it is extremely difficult to keep track of all the details, options, or availability of every vehicle. We are happy to verify any options, details, history reports, or other concerns our customers may have about a vehicle listed on our site. 3rd Party Sites that advertise for Dallas Autos Direct will sometimes have misinformation or old ads up from vehicles that have been sold. Please call to verify listings and details about the vehicles you are interested in and we will be more then happy to verify anything for our customers. We appreciate your interest in one of our beautiful vehicles and are happy to make any changes or updates to this site to match the inventory we have. Changes are made daily and we thank you for your patience. Sundays CLOSED but please do not hesitate to email or call after hours: You can reach any of the owners at anytime Hadi- 469.441.4065 Fadi- 214.436.1046 or email at DallasAutosDirect@gmail.com Dallas Autos Direct Pre-owned A vehicle is considered pre-owned if it has had at least one previous owner, and has previously been registered and issued a title. All of our vehicles have been required to meet all state inspections. Please ask associate for details. The condition of the vehicle can vary depending on the history of the vehicle. Dallas Autos Direct WILL NOT ASSUME responsibility for any repair after the purchase is final. All pre-owned vehicles are sold "AS IS". An extended warranty may be purchased to extend the existing manufacturers warranty. Please ask associate for details. ***Miles posted in this listing may not reflect local test driving, or road testing. Vehicle Options, Availability, and 3rd Party Advertising We do our best ensure all listings are current and accurate, but with such a diverse inventory it is extremely difficult to keep track of all the details, options, or availability of every vehicle. We are happy to verify any options, details, history reports, or other concerns our customers may have about a vehicle listed on our site. 3rd Party Sites that advertise for Dallas Autos Direct will sometimes have misinformation or old ads up from vehicles that have been sold. Please call to verify listings and details about the vehicles you are interested in and we will be more then happy to verify anything for our customers. We appreciate your interest in one of our beautiful vehicles and are happy to make any changes or updates to this site to match the inventory we have. Changes are made daily and we thank you for your patience. Winning bid includes only the sale price of the vehicle. Will not include additional fees which consist of some or all of the following: Winning bidder must pay a $500 deposit within 24 hours of auction closing with a major credit card as a form of deposit. ALL DEPOSITS ARE NON-REFUNDABLE. If deposit is not received then it will be considered a no-sale default. Buyer will be responsible to arrange deposit with sales associate upon auction closing. Deposits on vehicles not purchased are applied towards the significant cost of paperwork, title production, vehicle re-listing fees, and lost dealership productivity. Document and dealer service fees are collected by Dallas Autos Direct. All vehicles registered in Texas are subject to pay a 6.25% sales tax fee, registration and inspection fees. Out of state buyers may register and pay all of their home state applicable taxes and registration fees. **Please specify to associate upon purchase. All sales are subject to a $149 documentary fee. This Fee is applied for handling paperwork, filing titles, mailing and copying costs, these fees are fixed and non negotiable. Inspection and Administration fees applied Do you accept trades? Yes, Dallas Autos Direct welcomes your trade. If you are interested in trading in your vehicle, please contact associate for details. What forms of payment do you accept? We accept certified cashier checks drawn on US Banks in US funds. We also accept financing checks from your local bank or credit union, we are also happy to arrange financing for you. Please ask associate for LOW APR rates and pre-qualification application. I live out of state, how does the buying process work if I am paying cash? Cash Purchase from Out of State You place the winning bid and make the $500 eBay deposit thru a major credit card We contact each other via email and phone to finalize the transaction You FedEx certified funds for the remaining balance due plus any shipping charges When we receive your funds we ready the car for shipping, and deliver it to the local shipping terminal if needed - Your new car is now on it's way to you, typical delivery time is 7 to 14 days. We send you duplicate copies of the bill of sale, one for you to keep, and one for you to sign and return When we receive the signed bill of sale, we FedEx all title documentation You pickup your car at the destination terminal Transaction Complete! I live out of state, how does the buying process work if I am getting financing from my local credit union / bank? Working with your bank: You place the winning bid and make the $500 eBay deposit thru a major credit card We contact each other via email and phone to finalize the transaction We fax all required paperwork to your bank, including copies of the Purchase Order and Title documentation Your bank sends certified funds for the remaining balance due We FedEx your banking institution the title to the vehicle When we receive your funds we ready the car for shipping, and deliver it to the local shipping terminal if needed - Your new car is now on it's way to you, typical delivery time is 7 to 14 days. We send you duplicate copies of the bill of sale, one for you to keep, and one for you to sign and return You pickup your car at the destination terminal Transaction Complete! SHIPPING COMPANY We highly recommend Crestline Auto Transport. Their website is www.crestlineautotransport.com VEHICLE CONDITION REPORTS We encourage buyers to hire local mechanics, auto critics, and any other form of pre-sale inspection. At Dallas Autos Direct we carry high quality pre-owned vehicles and pride ourselves on a diverse inventory. Specializing in luxury but encouraging safety and reliability is our mission. We stride in offering our customers the most reliable models available in each make. As a common risk with purchasing any preowned product, underlying or progressive issues may exist, but we do our best to make sure all issues are addressed or non-existent. Options, Availability and 3rd Party Advertising We do our best ensure all listings are current and accurate, but with such a diverse inventory it is extremely difficult to keep track of all the details, options, or availability of every vehicle. We are happy to verify any options, details, history reports, or other concerns our customers may have about a vehicle listed on our site. 3rd Party Sites that advertise for Dallas Autos Direct will sometimes have misinformation or old ads up from vehicles that have been sold. Please call to verify listings and details about the vehicles you are interested in and we will be more then happy to verify anything for our customers. We appreciate your interest in one of our beautiful vehicles and are happy to make any changes or updates to this site to match the inventory we have. Changes are made daily and we thank you for your patience. Ad created by eCarList.com. Call 214-722-8200 to find out how eCarList can service your dealership. 15K MILES, COLLECTION CAR, ALL SERVICE RECORDS, V-8, NAVIGATION, DUAL EXHAUST, RARE CAR IN MINT CONDITION!! Call 727-452-7000 to Schedule a Test Drive... Over 70 pre-owned autos in stock... Finance options available for both Prime and Sub-Prime customers... we have a lender for almost every credit profile. 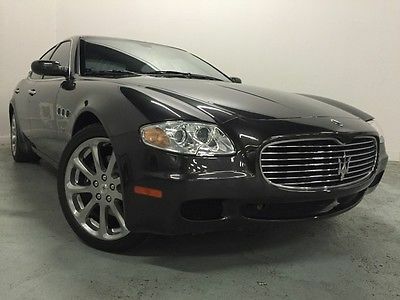 APR starting at 1.99% If you demand the best, this superb 2005 Maserati Quattroporte is the car for you. 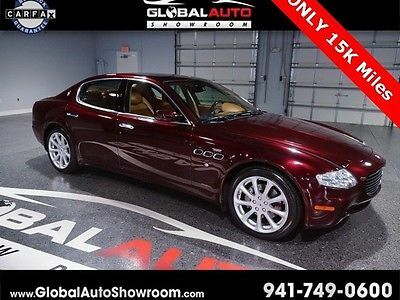 Photo Viewer 2002 Maserati VIEW OTHER AUCTIONS ASK SELLER QUESTION Vital Information Year Make Model Mileage 2002 Maserati 27,922 Exterior Interior Stock # VIN RED TAN HL236A ZAMBC38A620007550 Engine 4.2 8 CYL view window sticker Carfax Highlights View Carfax Report Not all accidents or other issues are reported to CARFAX. The number of owners is estimated. See the full CARFAX Report for additional information and glossary of terms. Carfax Highlights No Accidents / Damage Reported to CARFAXNo Airbag Deployment Reported to CARFAXVehicle Qualifies for the CARFAX Buyback GuaranteeNo Structural/Frame Damage Reported to CARFAXNo Manufacturer Recalls Reported to CARFAXNo Indication of an Odometer RollbackNo Total Loss Reported to CARFAX View All Photos Contact Us Dealer Contact Highline Auto Sales Inc Carfax Secure Online Credit Application Applying for a vehicle loan online is one of the quickest and easiest application methods. Our secure online application form is easy to complete, all you need are a few personal and employment details. Get started now. Below are a few of the other vehicles currently available from Highline Auto Sales Inc Shipping Highline Auto Sales Inc proudly recommends Earth Auto Shippers for your vehicle transport. Earth Auto Shippers is a fully licensed vehicle shipping company. Earth Auto Shippers offers "door-to-door" low-cost shipping services using enclosed and open trailers. View more info » About Us With years of experience serving the area, our dealership is dedicated to offering high-quality, pre-owned vehicles to our customers. From the moment you walk through our door, we're committed to providing you with a great car-buying experience. With our skilled sales staff and financing options, we'll help you get the vehicle you want, at the great price you deserve. Our goal is for you to be so delighted with your vehicle purchase that you'll come see us when you need your next car and will happily recommend us to friends and family. Customer referrals are the ultimate compliment. With many vehicle shopping options available, we differentiate ourselves by understanding our local car-buying community and satisfying its needs; helping valued local customers like you, find the vehicle that's the "right fit". Feel free to browse our inventory online and check out the Featured Vehicles section on our homepage. If you see a vehicle you like, submit an online quote request, or contact us to schedule a test drive. To learn more about our dealership and how we can help with your next vehicle purchase, please call or stop by in person. We look forward to meeting you. Ad created by eCarList.com. Call 214-722-8200 to find out how eCarList can service your dealership. TEXT ONLY!Read before even texting me! Car doesnt drive at all, you will have to tow it! only text me asking about the address and dont ask ANY QUESTIONS! 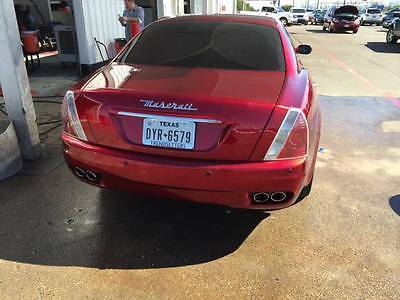 This is the last price, that $7,500 that you see, is the last price!2006 Maserati Quattroporte, 4 door, engine has leak, outside has a scratch damage on right and left side, trunk has a dent, front right side tire and battery needs replacement, interior needs a good clean up. it doesnt start, it doesnt drive.You will have to transfer the title when you buy it, and car has 84K miles and odometr says 134K miles, clerical error. but it has a clear title.Again YOU WILL HAVE TO TOW IT, it is parked at the dealership of my friend. Please dont ask any stupid questions, im not a mechanic myself, i bought it to fix with my dad, but he injured his shoulder while working on heavy duty mechanic.Price is FIRM! 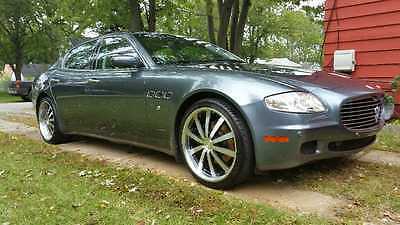 Dont even bother asking me for less, it is $100,000 car brand new, and im asking only $7,500 cash. Only wheels itself are like $5,000(google it, rucci wheels).Again, dont call me asking any kind of questions, and DONT WASTE MY TIME PLEASE!Thanks. 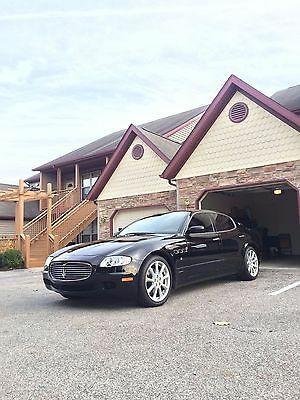 Hello,Up for sale is a 2005 Maserati Quattroporte. The car is in near perfect condition.The car currently has 25000 miles. It was a one-owner car for the past ten years,and I had the car for about 3 months. I do have all the maintenance and servicerecords of the car, and it needs absolutely nothing. 150 point inspection was doneat the Indianapolis Maserati dealership, and it passed every one of them. The clutchlife on the car is 83%, so it is phenomenal. The interior is 10/10. There are absolutelyno tears or wears. It is basically as new. There are a few door dings on the exterior,but the car has never been machine washed, so the paint is glossy as new also.Again, there are all paperworks with the car. Even the car fax shows all the maintenancedone on this car.As for the aftermarket parts, I currently have a Larini X-pipe ($700), Larini Rear mufflers ($3495)with valve control, high flow air filter, and a bluetooth system.I HAVE ALL THE OEM PARTS. The price does not include the exhaust system.I have put around 500 miles on the new exhaust system. If you would like the exhaust system,I'll be asking $3000 more on top of the asking price. The stock exhaust system is extremelyquiet. The current exhaust system sounds like a Ferrari. It has a high end crisp sound, withbubbling sounds when dropping from a high RPM.Please let me know! 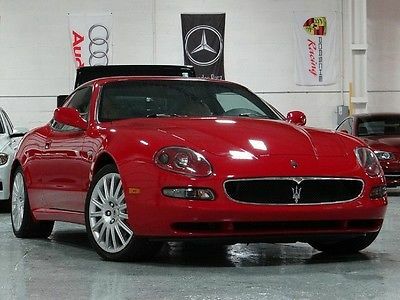 2005 Maserati Quattroporte with 400hp 4.2 Ferrari motor. Amazing 4 door luxury with supercar guts! ONLY 39,000 MILES! Duo sport transmission with auto and paddle shift. Good clutch, smooth responsive motor and transmission. No leaks squeaks or creaks. Near mint condition car! Newer tires and wheels, beautiful exaust note like nothing else! Clean bill of health and 0 miles on dealership scheduled maintenance service! Won't find another Quattroporte like it! Asking $28,000 Or best offer! Motivated to sell fast so dont be shy. Call Bret at 219 877 4922 with any questions!